Following on from our exciting announcement regarding our move to Monday.com, we have created a handy step-by-step guide. This also features useful tips we think you might like to use when you are up and running. Don’t forget you can use the platform on your desktop, as well as downloading the App to your phone so you are able to access your Design or Marketing campaign anywhere, at any time. This is the Monday.com Media Street Dashboard. We use shareable boards on the left hand sides for our clients, as well as internal boards for Media Street staff. The notifications tab will highlight any new updates or comments added to a campaign. Also, you are able to easily search for certain tasks or hashtags such as #content or #SEO in regards to your campaign, using the search tool. Below the Media Street banner you have the inbox feature. This allows you to send private mail to a member of staff if you have any questions or queries regarding the work schedule or monthly reports. Equally, if you have been tagged in comments they will appear in here. Comment bubble (we will discuss this further). Staff member(s) assigned to the tasks. The progress or ‘phase’ of the task. As the client and staff member you are also able to create a new ‘pulse’ if you would like to add a new task to the monthly schedule. Adding comments to a pulse is easy! The speech bubble displayed in the group is where you can add your own comments to the task. You are able to tag people in the comments using the ‘@’ tag to make sure the comment is highlighted in their notifications tab. (See image below). 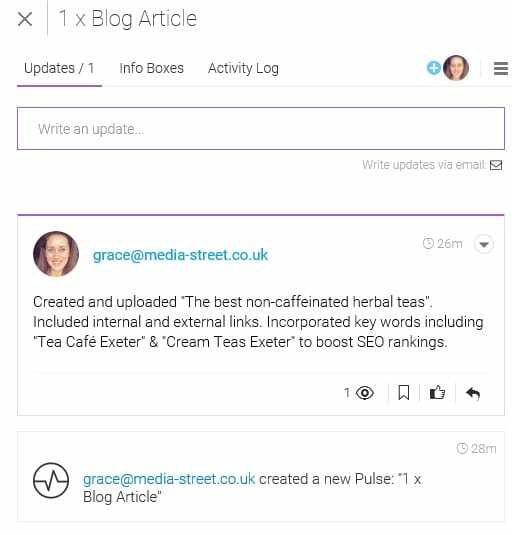 You can also add members of staff to the conversation, as well as edit your post and ‘liking’ it. These are the basics of using Monday, if you would have any questions regarding the use of the platform, as well as any suggestions on how we could improve – don’t hesitate to get in contact with your marketing representative at Media Street. There is also a Youtube Video which Monday.com produced which is also a useful tool if you have a spare 60 seconds. As Copywriting and Digital Marketing Assistant, Grace loves to get creative when it comes to writing. When she's not typing at the keyboard, going to the gym, cooking and laughing until her stomach hurts is what she enjoys doing the most!